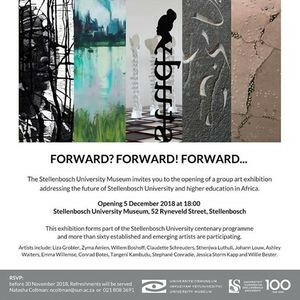 An invitation to an art exhibition at the Stellenbosch University Museum as part of the Stellenbosch University Centenary programme. Selected artworks by more than sixty established and emerging artists are included in this thought provoking group exhibition. An open call invited artists to propose artworks engaging with ideas about the future of higher education in the next hundred years. Submissions included innovative and compelling artworks, serving as catalysts for debate and engagement on the future of the Stellenbosch University and higher education in Africa.